Lets plan this year a stress-free holiday period. Do you have the same feeling as me that this year passed by in such a high tempo? It feels as I was writing last years Christmas post only a few weeks ago. So it is time to get organized again. This is something we can do well in advance. Making a to-do-list and being able to make a sign "done" is such a good feeling. It feels as we are in control and doing a good job. 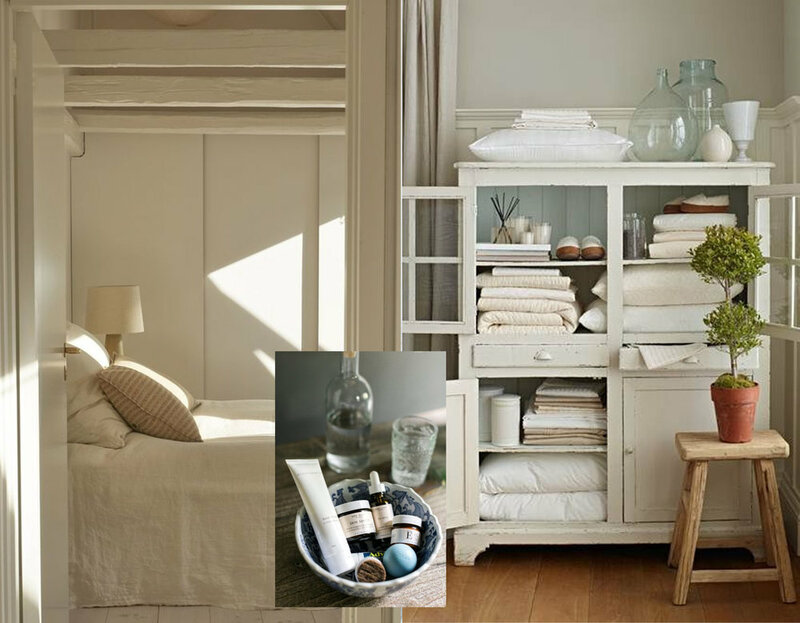 We don't need a lot in the guest room: clear out all the random things, fresh bed linen, an extra blanket in case your guests feel cold in the night. Take a look that they can unpack their travel bag, this can be a section in the wardrobe you have in that room or an extra cloth stand. Put a note with the WIFI password so they don't have to ask you. Just before they arrive you can put a bowl with dried fruits and nuts and a small flower arrangement in their room. Put small bottles with shampoo, shower gel in the bathroom, and maybe an extra toothbrush in case they forgot to put it in their luggage. A bar cart is the ultimate entertaining piece: chic and versatile, and it will be less work for you as your guests can help themselves to drinks. You just roll in the fun, you can arrange it depending on the occasion of them of the party. Invest in the right tools. Start thinking which drinks you want to offer or cocktails you want to make, test them and buy already the different ingredients, another thing which is of your list. The area in the house which is used several times a day is the kitchen, maybe we should take a look to see if can organize it better, to make daily life easier, not only thinking of the holidays. What about de-cluttering this room now before the hectic of the end of the year celebrations will overwhelm us? Lets empty the cabinets, get through everything and discard or donate things you never use, duplicate items, things you completely forgot about and didn't miss. Group items and re-arrange your cabinets trying to use as much as possible horizontal and vertical space. It is the moment to take out the seasonal items that only get used once or twice a year. Check the spot or LED lights under the suspended wall cabinets. Install some hooks underneath the cabinets to hang some kitchen tools, dish holder, measuring cups. 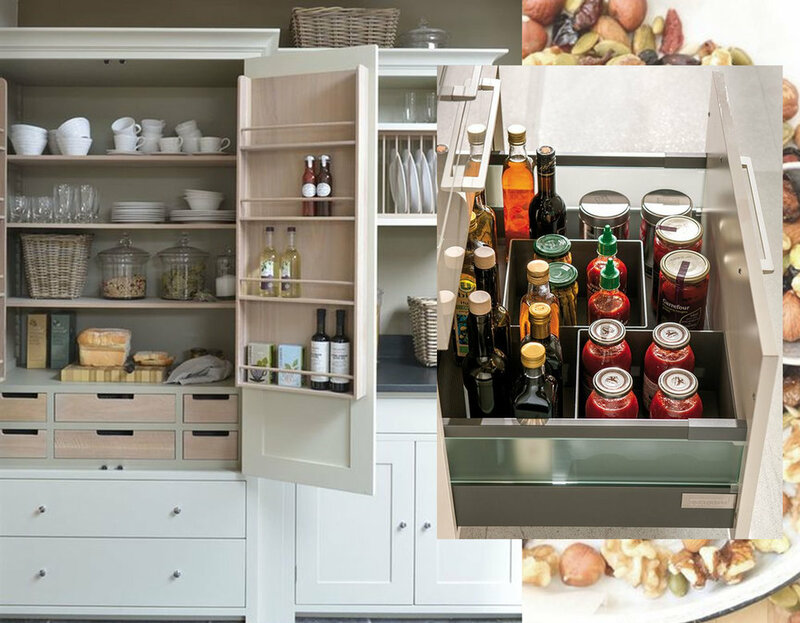 Everybody has his or her own style and this will guide you in organizing your working space and pantry. Reflect a bit on this so you will be able to work as smooth as possible in your kitchen. Maybe you can invest in some nice glass jars, label each so you can find things back in a glimpse of time. A lazy susan will help you to group small bottles, jars, and condiments. I like to have my cooking tools on the countertop in big ceramic pots. Maybe you prefer to have them in a drawer next to the cooking top, drawer organizers will keep your cutlery neatly separated. I was talking earlier of the bar cart in the living area but a cart in the kitchen can help you also a lot specially when preparing for a bigger group of people, it creates some extra counter top. If you will invest now time in de-cluttering and organizing your kitchen it will not only help your to get stress-free through dinner preparations but it will bring you also happiness in the next year. Still a month, lets make a list with the names for whom we want to buy a gift. Maybe you have some ideas, write them down so once you will get out to buy them you know exactly what to look for and this part will be more relaxed and you will keep the budget under control. I make my list in Evernote, easy to keep track of everything, on computer, IPad or IPhone. Once the gift is bought I make a sign as done. And as I still have the list of the last two years I don't have to think to hard to remember what I gave last year. Once done with the Christmas shopping we can start wrapping the gifts. Lets show our creativity this year, decide on a color, make some personalized labels and you will have your signature for the season. You don't need to buy expensive and glossy wrapping paper, simple white or brown craft paper will be the perfect base to get creative with. I think we all love to start decorating the house for the holiday season, some start as soon as Thanksgiving is over. Greenery will give the entrance an inviting touch. Maybe it is still to early to put up the Christmas tree but candles, and some touches of red will bring you slowly in the mood. 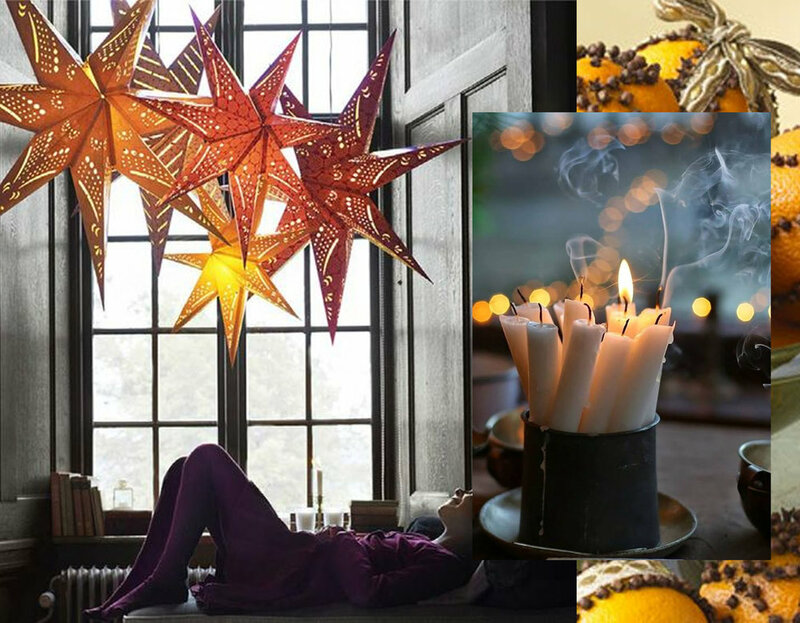 Some extra seasonal string lights will make your living room look more cosy. Decorating the mantel piece will bring the focus of the room around the open fire. Now that the days are short we want to feel good inside the home, let the long evening toward the holiday season be a time of relaxation after this hectic year. Take your cooking books out in the evening and start planning the menu. Will it be a formal dinner with family or a more relaxed atmosphere with friends? You should do all the cooking preparations this year or each member of the family is responsible for one of the dishes. Make your list, start shopping in time so you only have to go to the shop on the last day for the fresh ingredients. It is also the moment to think of the color of the plates, fitting the food you will serve. Table cloth and matching napkins. Smaller napkins in case you take the appetizers around the bar cart area. Check if you still have enough glasses. Make a wine selection, this is also something you can buy well in time. You want to go for a certain theme this year? Or a special color? Who knows now that you organized your kitchen maybe you found some nice table accessories you completely forgot about and they will be the starting point for this years table setting. Make it special, and this you can do without spending to much money. Take a look around in the house what you have, think of adding green on the table, candles. Give it a special touch and think of a small things for your guests to take home, something to remember this special evening. Plan on setting the table the day before. For two reasons: as last moment there is always still something you didn't think about and will ask more attention than you thought of. It will be fun to do it in a relaxed way and as you have time you can try different settings. And all you have to do before your guests arrive is to add the greenery and light the candles. Maybe you can also think of making a nice place card and there won't be any confusion of who will sit where. Last minutes shopping for the perfect outfit is not for me, shops are to busy, and maybe your size is no longer available. But as we organized our kitchen, maybe it also the moment to take a closer look to our wardrobe and with a fresh eye on what you have you can come up with a new combination and you will give a total new look by just buying some new accessoires. Hang your outfit somewhere that you can see it, create a small corner with a nice make up table and you will already enjoy the idea of party time. Now, relax with a glass of wine and remember that it is all about spending time with your loved ones and to make nice memories. You are ready for a great holiday season?